As regular visitors will know muffins are a regular feature for my weekend breakfasts. I am always looking for new muffin ideas and having recently made a decision to cut down on my consumption of animal products for environmental reasons I have been experimenting with different vegan muffins. Okara (more of below) blueberry and lemon combine to make a light zingy breakfast muffin full of fibre, protein and antioxidants. The tricky part of vegan baking is what to use in place of an egg. Happily for making muffins I seem to just be able to use my regular muffin batter, leave the egg out and use slightly less of the dry ingredients and use soy milk in the place of milk. I use soy milk as a milk replacer, frozen and defrosted soy milk is ideal for baking (I freeze it in 1oz portions in my mini muffin tray) – it does separate but it also thickens and it makes it an excellent milk and egg mix substitute. I am completely enthralled by vegan baking and far prefer it to traditional cakes where I can now clearly taste the egg. I also had a quantity of okara from my homemade tofu experiments to use. Okara is the ground soy bean pulp that is left over when you make your own soy milk (I partially dry it in a low oven and then freeze it). It is packed with protein and fibre and can be used in a number of ways. Here I used it in place of some of the flour in the recipe. It has a texture half way between cornmeal and desiccated coconut, and lightens the texture and colour of the finished muffins (and counts towards your daily fruit and vegetable intake). If you do not have any, just leave it out and use extra flour. Detailed muffin instructions are here. 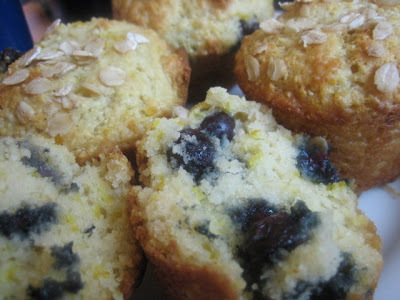 If you try this Easy Vegan Lemon & Blueberry Muffin Recipe please tag #FussFreeFlavours on Instagram or Twitter. It is amazing for me when for me when you make one of my recipes and I really do love to see them. You can also share it on my Facebook page. Please pin this recipe to Pinterest too! Thanks for reading Fuss Free Flavours! Delicious muffins that also use okara from making home made soya milk. Pour the wet ingredients into a jug and whisk with a fork. Dollop into muffin tins and sprinkle with oats. Bake at GM5 for 20 to 25 minutes until risen and golden. 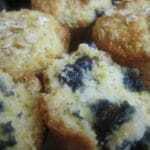 *If using frozen blueberries just add them to the batter directly from the freezer and bake for another minute or two.